“The welfare of all rabbits is our primary consideration,” states the HRS. Sounds great, doesn’t it?! And it should; it is one of the primary tenets in the HRS Philosophy statement. But, unless you recognize their use of animal rights buzz-words with their deeper code-meanings, you’ll have NO IDEA what the House Rabbit Society philosophy statement is REALLY saying. And actually, they aren’t ready for you to understand the big picture just yet. Why? Because they still need and want your money to accomplish their goals. 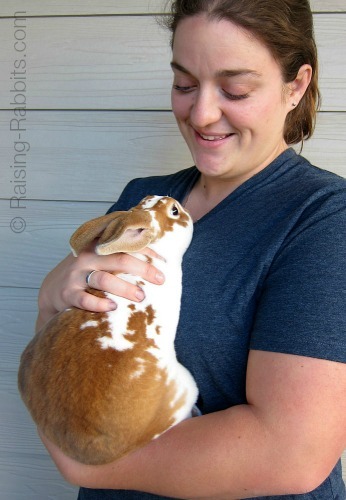 If you keep on thinking they really DO care about your rabbits, you’ll PAY them (through donations and monthly dues) to keep on pursuing their plans. Their goals, you'll soon learn, are goals that you desperately do NOT want to happen. Remember, we're talking double meanings. Only by keeping you in ignorance (for now) will they achieve those goals. Carmen is thrilled with her pet rabbit! The House Rabbit Society is an animal rights organization focused on convincing the public that rabbits need to live in houses, while their ultimate (hidden) intent, along with all other animal rights groups, is to eliminate all human uses and direct interactions with animals. We'll show you from their own words below why this is an accurate assessment. The first animal rights extremist sentiment surfaced around 1950. 30 years later that ideology had begun to gel in various organizations, such as HSUS and PETA. Some organizations, such as Animal Liberation Front, use terrorist tactics. The House Rabbit Society came on the scene in 1988. 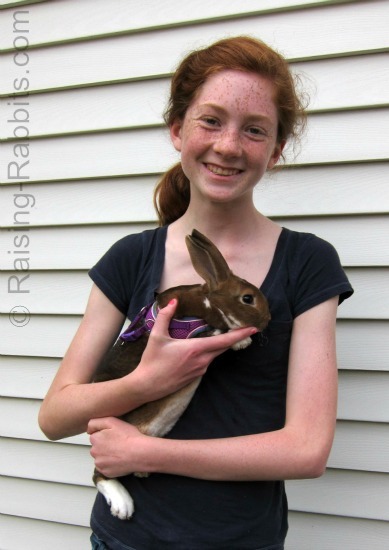 On the surface, the HRS is an organization dedicated to 11th hour rescues and adoptions of unwanted rabbits. The use of educational materials to reduce the number of unwanted rabbits, to improve bunnies' lives, and help people better understand rabbits, which they think are misunderstood. They are not fit for being pets. These are the rabbits that have become mean and which bite. The reasons for this might be illness, or extreme dominance. It might even be the result of a female who wants to do what her nature craves - to mate and have litter after litter of bunnies. This doe might not be fit to be a pet, but she would make a wonderful brood doe for meat rabbits depending on her other qualities. Occasionally a saddened rabbit owner drops off his rabbits at the pound due to a change in his living situation. Perhaps a move to a new apartment. Perhaps a new spouse allergic to rabbits. Perhaps a new military deployment. Regardless of the change, for some reason new living arrangements do not allow rabbits. Such animals would be great candidates for rescue. For years the local pound functioned as a conduit for these latter rabbits, and euthanized the ones that were not fit to be pets. Unfortunately, the House Rabbit Society buys into an ideology that not only cannot tell the difference between these two groups of rabbits, but also doesn't believe humans should exploit (read: have) pet rabbits, or use animals or animal products. It's an overwhelming task, but they've been working on it tirelessly for over 30 years by flooding the internet and the courtroom with propaganda intended to affect public opinion. It's working, at least somewhat. Every dog and cat breeder is now operating a puppy or kitten mill, even if they own a single dog or cat and would like to have a single litter from her. People don't buy and sell animals any more - they rescue and re-home and adopt out. By refusing to use the animal rights terminology, pet owners and animal breeders will help to restore honor to agriculture and pet ownership (and make a heck of a lot more work for the animal rights gang). Someone hypnotized these very cute li'l bunnies! The House Rabbit Society was formed to spearhead the process with pet rabbits for two reasons: First, due to the ease of characterizing cute, cuddly rabbits as pets only, and second, because of the fewer numbers of pet rabbits. Today, if they can divide and conquer the pet rabbit sector, it may be easier for them to apply similar tactics to the dog and cat sector, and with greater force. If you didn't realize that the House Rabbit Society was an animal rights group with the intent of eliminating pet rabbits, it might help you to know that we didn't just make it all up. Our information comes from the statements of the House Rabbit Society itself. I have also drawn information from the statements, ideology, and action plans of other animal rights organizations, that use code terminology identical to the terms used in the House Rabbit Society Philosophy statement and on other pages of the House Rabbit Society website. The philosophy statement of the HRS by itself can give you an eyeful. We'll comb through it in its entirety, sniff out the double intent, and learn EXACTLY WHAT the HRS has ultimately planned for your pets. You'll find links to supporting information. If you'd later like to check out their website directly, the link is below, and now you will be alert to the terms and hidden meanings you will encounter. The 7 bullet points (in orange font below) are components of the House Rabbit Society Philosophy statement (found here). Once we explain their "secret code" meanings, we'll reword their Philosophy statement into plain English so that it says exactly what they mean. Paragraph 1: The House Rabbit Society believes that ALL rabbits are valuable as individuals, regardless of breed purity, temperament, state of health, or relationship to humans. The welfare of all rabbits is our primary consideration. This is the smokescreen. This is what they want you to believe about them with all your heart. What they neglect to mention here, but you'll find it out later in their statement (below), is that they have very little respect for or actual interest in the domestic rabbit as a subspecies. They are currently maintaining a charade of interest for the sake of obtaining your donations. This statement in the first paragraph of their Philosophy imputes a value not just to a herd but to every individual rabbit. If your rabbit has intrinsic value in itself and a moral right to life, then the implication is that you must never, ever, give up on or abandon your pet rabbit. If your rabbit gets sick, breaks its back, or becomes mean and vicious, you’re pretty much stuck, out of luck. It doesn’t matter if some animals will never be suitable for pethood. The House Rabbit Society wants you to think you must render care no matter what, even if you have to drain your savings account in order to provide medical or surgical care for rabbits who cannot possibly survive the treatment. One or two such experiences with sick rabbits, and you'll sour on the idea of keeping pet rabbits. It also implies criminality in killing and eating livestock rabbits. The belief that individual rabbits carry intrinsic value stems from the underlying vegan religion that equates humans and animals. Ingrid Newkirk, founder of PETA, famously said: "A rat is a pig is a dog is a boy." Meaning: there is no difference between species, including humans. Newkirk wants you to devalue yourself to the level of a rat, but she also forgets that various species prey on various other species. Humans are known as apex predators for a reason. We cannot survive in the long term without consuming at least a little bit of animal nutrients regularly, and we have used our superior intellect to survive despite a lack of certain carnivore traits such as extreme speed or long talons, or wings, etc. The human need for animal nutrients is very difficult for some vegans to grasp, especially if they have become vegan for so-called ethical reasons. What makes it difficult is that once vegan, they feel really good healthwise, possibly for several years. But this euphoria never lasts. At least, not without very careful nutritional supplementation. See Vitamin B12 Deficiency for details. Those that haven't reached the feel-miserable stage argue tooth and nail with me in the comments at the foot of the page where we compare carnivore, herbivore, and omnivore digestive systems. They tell me vehemently that humans are actually herbivores and are meant to be vegans. But when I ask them to go take a look at what exactly it means to be an herbivore, the silence becomes deafening. I’m sure I have changed no one’s mind…which doesn’t change the truth. Humans NEED animals and animal nutrition for basic survival. Paragraph 2: In line with our mission, we are against the exploitation of rabbits. Here's the first major clue as to how the House Rabbit Society really feels about your pet rabbits -- learned through their intentional use of the code word, “exploitation." The uninitiated might think this just means you should be nice to your rabbits. Whenever the words "animal" (in this case the specific animal: "rabbit") and "exploitation" are used in the same sentence, it always refers to any ownership or uses at all of animals by humans. A synonym of animal exploitation would be "animal slavery" (think your pet rabbits in cages), with the implication that any uses of animals, even pethood, is cruel. The House Rabbit Society is hiding from you their belief that pet rabbits, by virtue of not being wild, are being exploited, and they are against this. Translation: Human ownership and uses of all animals, including pet rabbits, has to stop because that is exploitation in their minds. Still unclear? Type 'animal exploitation' into any search engine, and you'll get an earful. Paragraph 3: Except for unique situations, in which wild animals are being nursed or rehabilitated, it is in the best interest of wild rabbits that human intervention be held to a minimum. Paragraph 4: Domestic rabbits are not the product of natural selection, but rather of human interference by means of breeding programs, and the product is a human-dependent animal who needs protection. It is therefore a human responsibility that these animals be cared for in a manner appropriate to their needs. Despite the statements at the outset of the House Rabbit Society philosophy that all rabbits have value, you now learn that this does not actually include your domestic pet rabbits. Because domestic rabbits are the product of human interference, they are therefore devalued as weak freaks of nature needing protection. This is solely because they are not the result of natural selection. Actually, human-dependence is not a sign of weakness, it is evidence of a symbiotic relationship between rabbits and humans. Some scientists would go so far as to ask: "Who is using whom?" because the benefits go both ways. Human care of domestic rabbits results in a strengthening of both rabbit health and rabbit numbers. (In the wild, 75% of young rabbits have become prey by age 3 months.) Human care of a herd of rabbits is clearly ideal for the domestic rabbit. The huge benefits result in an explosion of the rabbit population - lots and lots of healthy rabbits due to good rabbit husbandry (not interference). The trade-off results in benefit to humans as well. The overage of rabbits cannot continue unabated. So the wise farmer or rabbit breeder harvests the animals that provide the least benefit to the herd. Ideally, the numbers of rabbits within the herd remain steady or fluctuate slightly with the seasons or the needs. The end result of this symbiotic relationship is a community of healthy human individuals with meat on the table, and a rabbit herd that stays safe and healthy. It's a win-win all the way around, which is the meaning of symbiosis - benefits to both species which could not occur without the relationship. But, having human-dependent animals is anathema to a group that is fighting to wean people away from animals entirely. Paragraph 5: It is in the best interest of domestic rabbits to be neutered/spayed, to live in human housing where supervision and protection are provided, and to be treated for illnesses by veterinarians. You knew it was coming. The House Rabbit Society solution for these domestic freak rabbits (your pets) that are reliant on humans is to spay or neuter every one of them until they have all gone extinct. “One generation and out,” is the description of past HSUS CEO Wayne Pacelle, who feels every bit as much animosity against domestic animals as PETA and the HRS. Think through the logic of the first sentence of Paragraph 5 taken at face value. If you truly had the "best interest of domestic rabbits" in mind, neutering or spaying should be the farthest thing from your mind. To support a species, you WANT the species to continue multiplying. Therefore if you want to support domestic rabbits, you should support the efforts of rabbit breeders, who truly have the best interests of domestic rabbits at heart. And while you're at it, purchase your next purebred rabbit or pet rabbit directly from a local rabbit breeder. This is not an indictment of spay/neuter per se. If you have pet rabbits and no intention or desire to breed them, then by all means, resort to S/N. But at least now you know WHY the big push to spay/neuter everything with 4 legs. Secondly, what nonsense is it to think rabbits require a life in a stick dwelling among humans. This is consistent with the House Rabbit Society's view of domestic rabbits as cripples. It is also more pressure and guilt applied to pet lovers to make pet ownership more and more a chore, and less and less desirable. At some point, the burden may become too great. One small failure of oversight, one anonymous complaint, and the House Rabbit Society swoops in, accuses you of animal abuse, and removes every single animal from your care – dogs, cats, rabbits, chickens, gerbils, hamsters, goats, all of them. A signature relinquishing all claim to the animals will be extorted from you under threat of thousands of dollars of fees and fines, PER DAY. Before you can say good grief, they are all spayed, neutered, and adopted out to “forever homes.” No matter that yours WAS a forever home. The House Rabbit Society will use a circus of publicity from start to finish to beg for donations and refill their war chests. People will flock to “rescue” your animals that never needed rescuing in the first place. This scenario has played out hundreds of times, and it is still playing out in multiple court cases right now. Don't think they won't do the same to you. They will. In a heartbeat. It is part of their goals, falling under the heading of "assisting humane societies," those quasi-official groups employing Animal Control Officers who are relied upon by Police Departments and given nearly carte-blanche authority to make your life a living hell should charges of animal cruelty be made. Lastly, the HRS wants veterinarians to be the sole repository of health wisdom for your domestic rabbits. Interestingly, both the HRS and veterinarians know that 95% of rabbit health challenges can be properly and well-addressed by any rabbit breeder with experience or access to the internet. One of the better resources (if I do say so myself!) 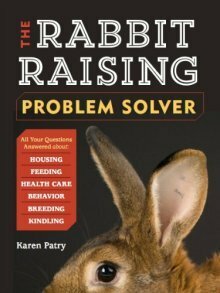 is Rabbit Raising Problem Solver, which draws both from wide experience and many internet sources, and then presents the gamut of rabbit questions and diseases and what to do about them in a single volume. Yes, the book does recommend consulting a vet when you need to, which is how it should be. Why the House Rabbit Society should think otherwise may be due to a goal of making it harder and harder for you and me to own and enjoy our pet rabbits. Paragraph 6: Domestic rabbits are companion animals and should be afforded at least the same individual rights, level of care, and opportunity for longevity as commonly afforded to dogs and cats who live as human companions. This and the next point are focused on redefining both the rabbit species and their characteristics. Here the House Rabbit Society eliminates agricultural uses and defines rabbits as only companion animals. Rabbits can be pets, of course, and have been for perhaps 150 years. But rabbits were not originally pets. They have been livestock animals for millennia, used for food, wool, and clothing for at least 5000 years that we know of. They are still used around the globe as livestock. The animal rights term 'companion animal' is purposefully deployed in order to minimize the concept of ownership. It's easier to grant "rights" to animals if they are not the property of humans, but the companion of humans. Regarding equality to dogs and cats, not a chance. Dogs and cats are fundamentally different than rabbits. Cats are obligate carnivores. Dogs are technically omnivores with a strong carnivore bent. Rabbits, on the other hand, are herbivore prey animals. Dogs and cats have for millennia provided services for humans. They help in the hunt. They do search and rescue. They are service dogs. Every barn in America (including ours) has a few barn cats that keep the rats and mice population under control and out of the feed. The black plague which killed 25% of Europeans in the dark ages occurred when cats were banished and the rat population exploded out of control. We need our dogs and cats. Whenever rabbits "work" for humans, it isn't work they do. Rabbits give their all, or at least their wool. Rabbits are prey animals used agriculturally for food and clothing. Wool breeds are kept for their angora fibers which can be obtained by shearing or plucking on a quarterly basis. Rabbits give their all to many other species as well. In the wild, the only right of a prey animal is the right to attempt to flee. In captivity, your pet rabbits are pets only because you CHOOSE to give them that privilege, not because they deserve it or have any moral right to pethood. 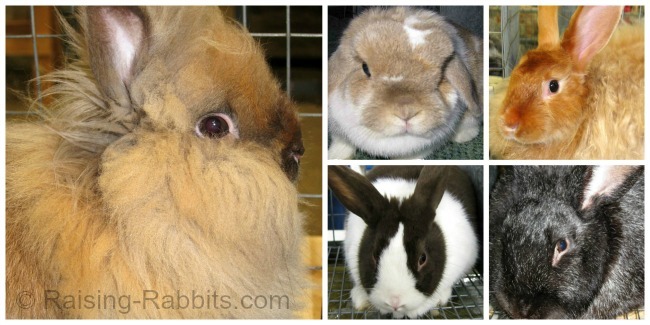 Plenty of other rabbit owners still see their rabbits as livestock. This is every bit as valid a use for rabbits. Please note also, by the way, that livestock rabbits never darken the door of the pound. They are never unwanted, and never require "re-homing." The existence of livestock rabbits nevertheless puts the HRS into full body shivers because it invalidates their whole reason for being. Paragraph 7: Rabbits are intelligent, social animals who require mental stimulation, toys, exercise, environmental activity, and social interaction (from, as appropriate, people, other rabbits, or other animals). This is just more redefinition. The operative word here may be "require," so that you will be compelled to serve the rabbit until it is too much for you. Are rabbits intelligent? They have rabbit-smarts, but have you ever seen search-and-rescue rabbits? Nope, rabbits are nowhere near as intelligent as dogs or cats (that’s a hard one, I know), though they can be trained to use a litter box and jump over rabbit hurdles. 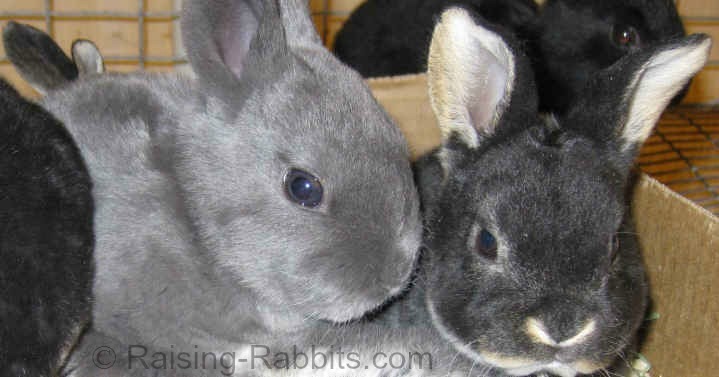 They are social, to the degree that is customary among members of a rabbit warren or colony. So, what exactly is the House Rabbit Society Philosophy SAYING? 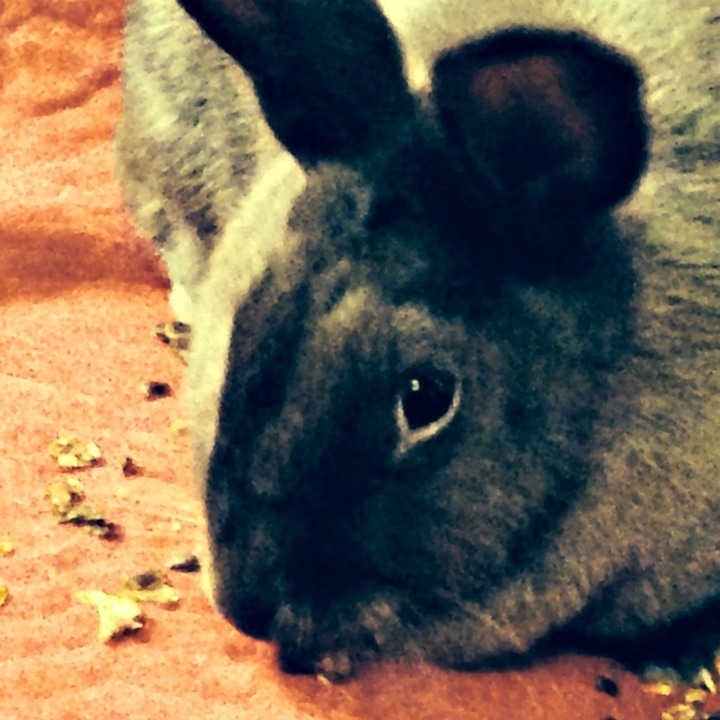 This bunny is snacking on Bunny Branola, a healthful and stress-relieving feed supplement. Here is what the House Rabbit Society is saying, in plain English. You'll also discover some of the results their philosophy will bring to your life. Paragraph 1: Our animal rights beliefs (that all animal species are equal, including humans) forbid ever harming a single individual rabbit, regardless of breed, health, temperament, or status. (We know PETA kills animals, but they are the unruly sibling, and we're still keeping our cards close to the chest.) 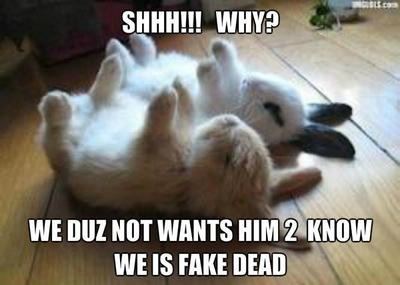 Therefore, we believe it is morally wrong to kill/euthanize a defective or unsuitable rabbit. Eating rabbits is reprehensible, and should be criminalized as cruelty. If your rabbit turns mean and bites all the time, that rabbit still must not be euthanized. You're stuck with it for the next 10 years. If not, we think it should be 're-homed' to an unsuspecting victim, er, bunny-parent. Paragraph 4: We think natural selection is the only force that should come into play when it comes to animals. Therefore domestic rabbits are defective due to human interference. They are weak cripples that need humans to take care of them. Okay then! You have them so take care of every last one of them no matter their needs (at least until our plan has brought the domestic rabbit to extinction). Will the House Rabbit Society work itself out of a job? If their plan works, yes. Once the domestic rabbit has gone extinct, both prongs of the House Rabbit Society mission will have been accomplished. There will be no more work for them to do. Little do they realize that IF their animal rights agenda achieves its goal and animals are eliminated from the human experience, they, and all of us, will be scrambling for our very survival. Lierre Keith's book, The Vegetarian Myth, explains in very readable fashion why veganism could be the death of both humans AND the planet. We recommend a solid read-through.